Vintage From Paul is delighted to offer these classic Shenango Carlton Calla Lily Restaurant Ware Luncheon Plates. The rim has the laurel leaf design of Carlton accented with peach Calla Lilies at the inner verge. Each of the available Shenango Carlton Calla Lily Restaurant Ware Luncheon Plates is in Mint condition with no chips, cracks, staining or crazing. The Luncheon Plates appear to have never been used. The Shenango Carlton Calla Lily Restaurant Ware Luncheon Plates measure 9 inches in diameter. 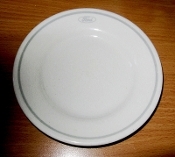 The Shenango Carlton Calla Lily Restaurant Ware Luncheon Plates are marked with " Shenango China, New Castle, Pa, U.S.A., Anchor Hocking B-8".